Year in and year out, camping festivals across the nation bring out creative aspects to their max potential. From bringing in local artists through world-renowned headliners to crazy and unique art installations and to dank food trucks supplying quality energy. The production that comes into each and every one of these festivals is absolutely next level and showcases each festival’s own distinct vibe. There are HUNDREDS of festivals across the nation and bringing it down to a top 10 is not easy…so the list was decided through the recalling previous years and the experiences the team witnessed, as well as your, the reader’s feedback, production quality, the vibe of the crowd/artist and of course, the location. Nature and scenery is everything! Some of the festivals have already announced their 2018 lineups and we did incorporate this information into this list as the lineups are just insanely stacked! We hope you enjoy the list and make sure to support your local festival, artists, friends, producers… just everyone – so we can all blossom in our passions. Show love, spread love. One of the first major camping festivals of the year, Gem and Jam Festival in Tucson, Arizona. Hosted January 25 – 28th, it happens to be during the biggest Gem & Mineral show on the planet, which is spread all over the whole city of Tucson. Gem and Jam has the perfect time spot to showcase talent through music, arts, workshops, performance arts, and so much more creativity! 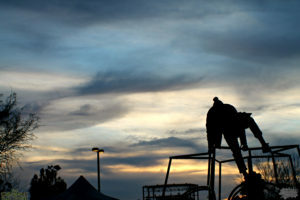 Hosted on the Pima County Fairgrounds and returning for their 2nd year there, Gem and Jam Festival is going to blow the minds of many with their upgrades to the production, as they listened to the audiences’ feedback from the previous year. 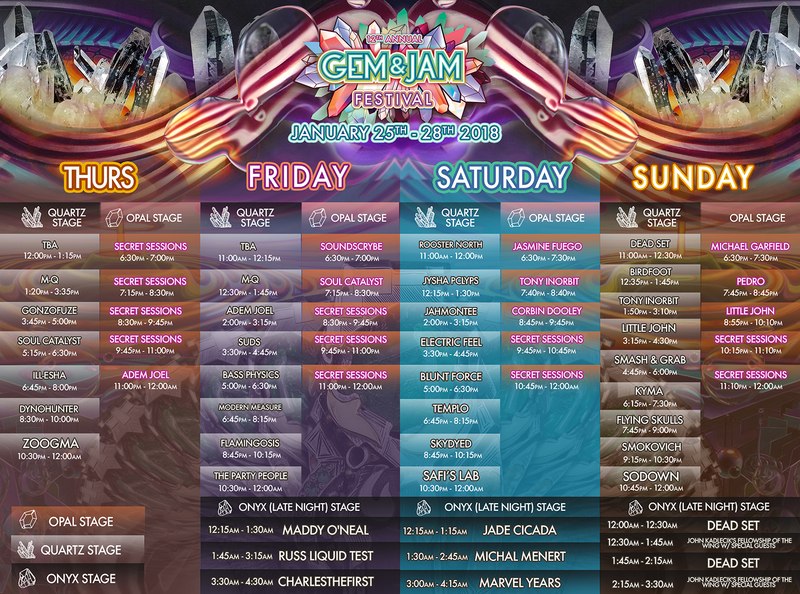 Adding in better campground space, increased production, another stage, and more art, Gem & Jam is looking at their biggest year yet! 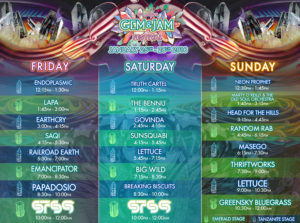 Check out their insane 2018 lineup with 2 nights of STS9, Papadosio, [Br]eaking [Bi]scuits (Break Science + The Disco Biscuits) Govinda, Jade Cicada, Big Wild, and so much more. 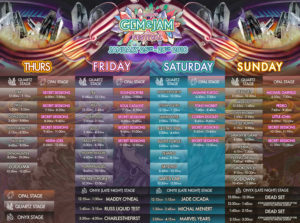 Gem and Jam establishes the ultimate blend of Jam and Electronic music. 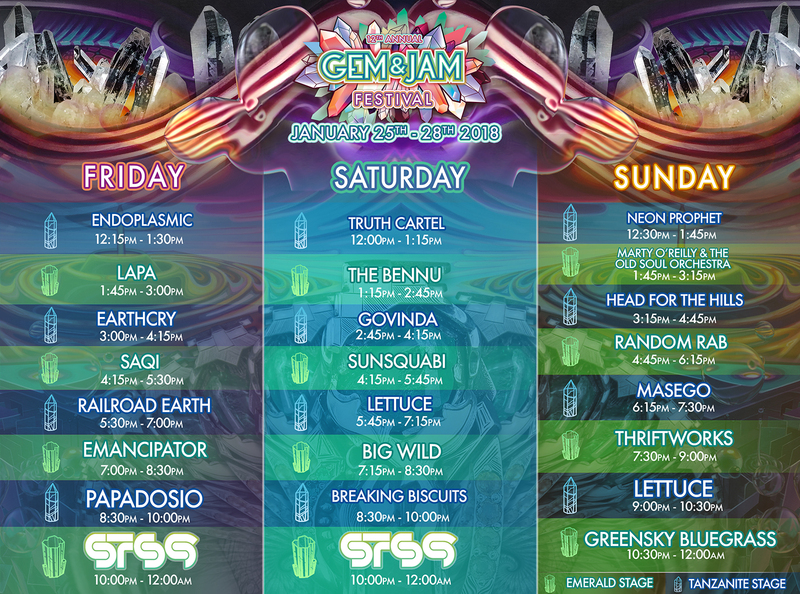 On top of that, Gem and Jam has a unique two main stage feature, where a main stage is consistently active, giving you the opportunity to consistently catch music without having to wait for a take down and set up for the next act. Check out their schedules below! 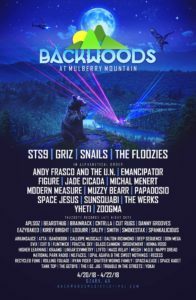 After taking a year off in 2017 to re-establish their ground, Backwoods Music Festival is making their triumphant return in 2018 and to none other than the revered lands of Mulberry Mountain in the Ozarks of Arkansas. This venue location is renowned for bluegrass and jam festivals and what was the mid-west colossus for camping festivals, Wakarusa. Backwoods had started in Oklahoma and showcased the beauty of diverse and creative stages as they had 7+ stages, all uniques designed to its own specific theme. The lands at Mulberry Mountain will be perfect for this festival as it is extremely vast and has tons of space for activities. 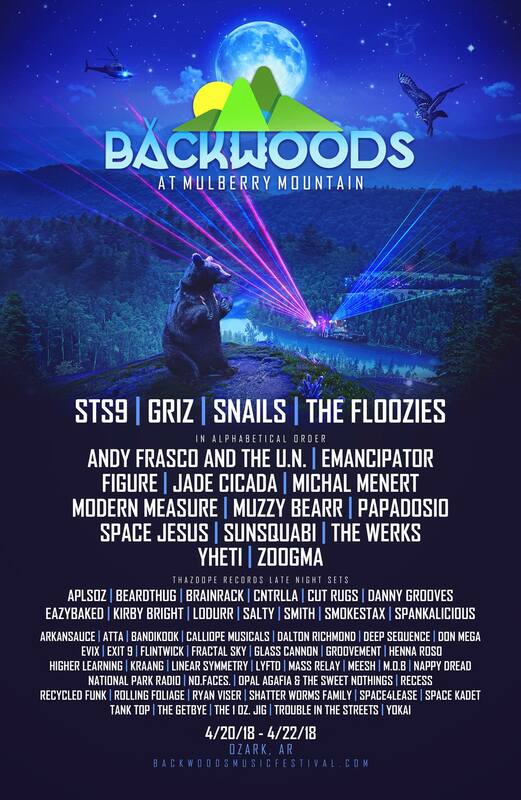 Backwoods has just released their latest additions to their banging lineup, don’t miss out on this festival as you’ll experience and discover oh so much. 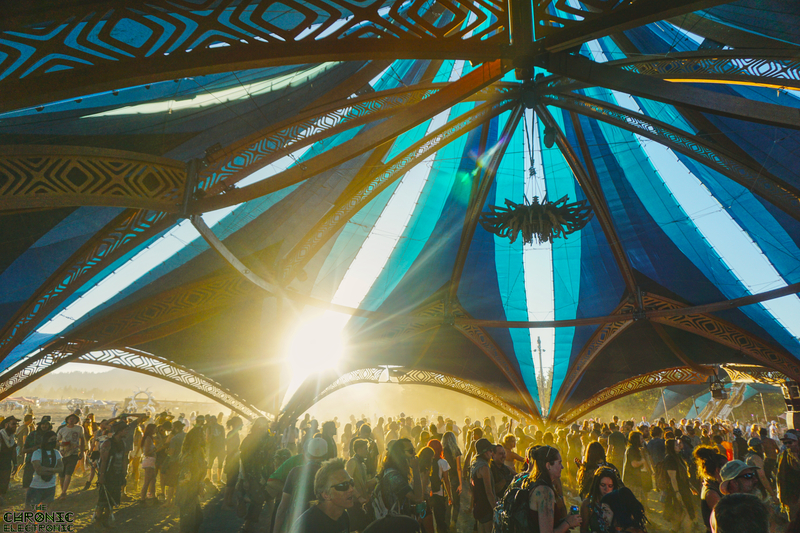 One of the major camping festivals leading the scene for the west coast, Lightning in a Bottle. Nested in Bradley, California, during Memorial Weekend, L.i.B consistently brings in a diverse and massive lineup that caters to the hearts of many. Along with the brilliant booking, they are home to the Do LaB, which is one of the most innovative and aspiring production companies who’s goal is “Design, build, and nurture festivals and event experiences that inspire authentic connections to ourselves, our community and the environment.” They bring in some of the dankest stage design in the nation and with Lightning in a Bottle as an extremely creative environment, Do LaB will bring their top quality production for this year. 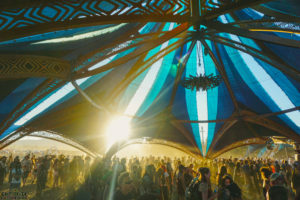 With epic stage design, amazing history of fantastic lineups, and the best of vibes from the staff to the audience, Lightning in a Bottle is a one of a kind festival. They even have a section about Headdresses, which should be looked at if you own one. Don’t miss out on this one as we expect it to be one of the most memorible festivals of the year! Tickets go on sale 1/18! 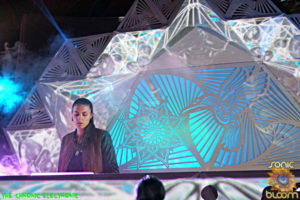 One of the Stages Do LaB Created, Lilikoi at Oregon Eclipse. Another heavyweight festival of the west, but this time in Canada! 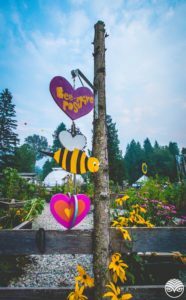 Hosted on an extremely beautiful ranch on the Salmo River, in British Columbia, Shambhala Music Festival is hitting 2018 with their 21st anniversary on August 10-13th! And guess what?! No alcohol allowed! Sorry but this place is renowned for its beauty and the connection with the environment. They keep it that much more clean by having that rule and with that comes the best of vibes. Shambhala is renowned for their creative and mind-blowing stage design with music practically going all hours of the day on one of the best audio systems, PK Sound. They are known for their heavy bass acts while still catering to the local scene. Here you will be going with the flow and along that path, you’ll discover the wonders of the Shambhala forest and the audience it brings. Tickets fly for this legendary event! Buy your tickets asap, but only if you are capable of properly disposing what you bring to the festival as it is a leave-no-trace event! It is worth the travel, no matter where you are! Don’t be afraid to risk it for the biscuit, as this biscuit will give you a beautiful, unique experience, and growth in spirituality, positivity, creativity, and energy! 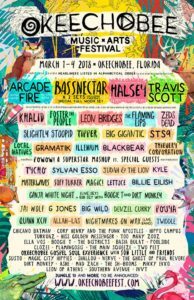 Okeechobee, one of the newer, major camping festivals, and definitely one of the largest on the east coast. 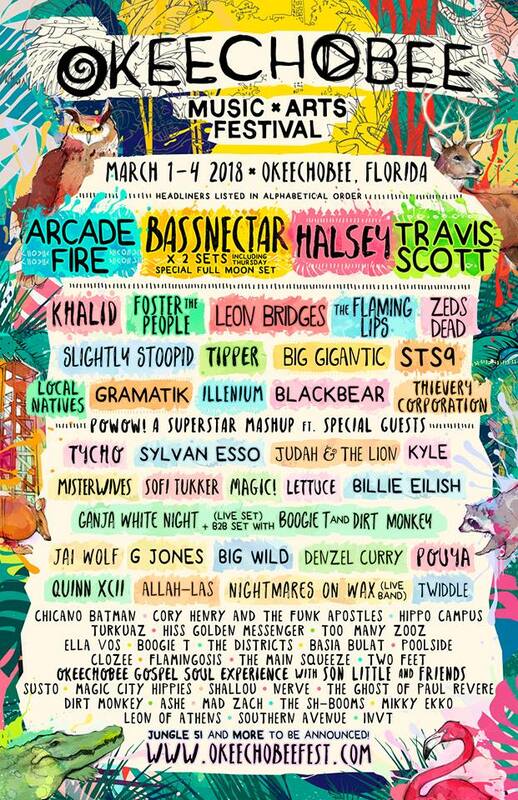 Approaching its 3rd year on March 1-4th in Okeechobee, Florida, 2018 seems to be one for the books! Not only are they bringing in new production for improved visual and audio, but they went all out on their lineup. From 2 sets of Bassnectar, one of them being a special full moon set, plus Halsey, Arcade Fire, Gramatik, Tipper, STS9, Slightly Stoopid, and so many more great headlining acts! But Okeechobee also has the underground music on lock down with CloZee, Dirt Monkey b2b Subtronics, Too Many Zooz, and a handful more! Even though they are a fresh festival compared to some of the other 10-20 year reigning festivals, we predict this is gonna be the biggest year yet for Okeechobee, which is just gonna set them in the path of success for creating countless memories for the years to come. Grab your tickets here: as this events is within 2 months! 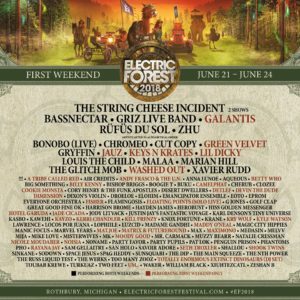 In 2017, Electric Forest debuted their back-to-back weekends and it was phenomenal! Giving the fans of Electric Forest a bigger opportunity to join the revered Forest Fam. 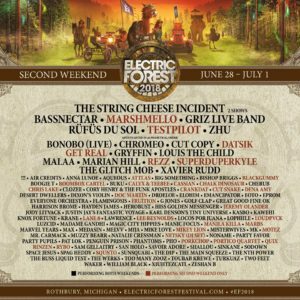 Hosted on J.J. Ranch in Rothbury, Michigan, with Weekend One during June 21-24 and Weekend Two during June 28- July 1. Now, before we even get into the beyond disgusting lineup, lets just point out the obvious. Electric Forest is a place built for you to get lost… but you are never really lost, you only discover, learn, create, and interact! 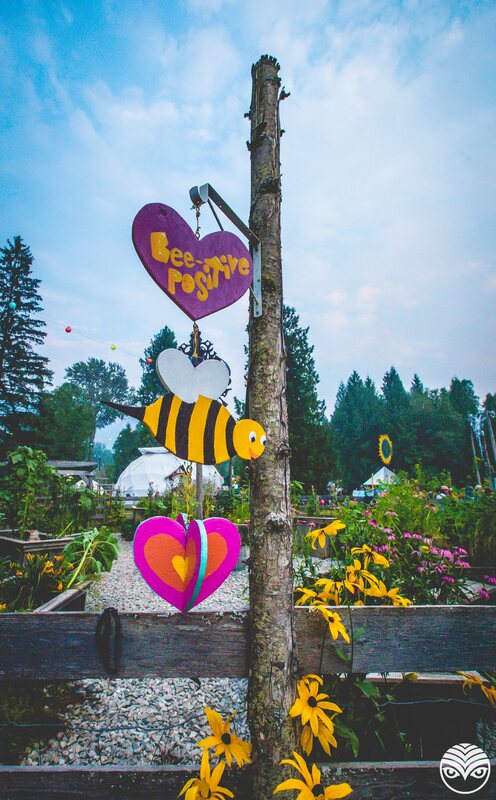 Not only do you come across some of the most beautiful and enlightening people in the Forest, but the vast amounts of carefully thought out art installations seem to be never-ending. When you thought you have discovered it all, you’ll find a new quote or piece of art, or even another stage that you had no idea about. Not only is this place extremely vast, but it was built to be a field of dreams. Back in the 50’s, the owner of J.J Ranch, planted the Forest, seed by seed, with the hopes of it becoming a place of freedom of expression. That it did. 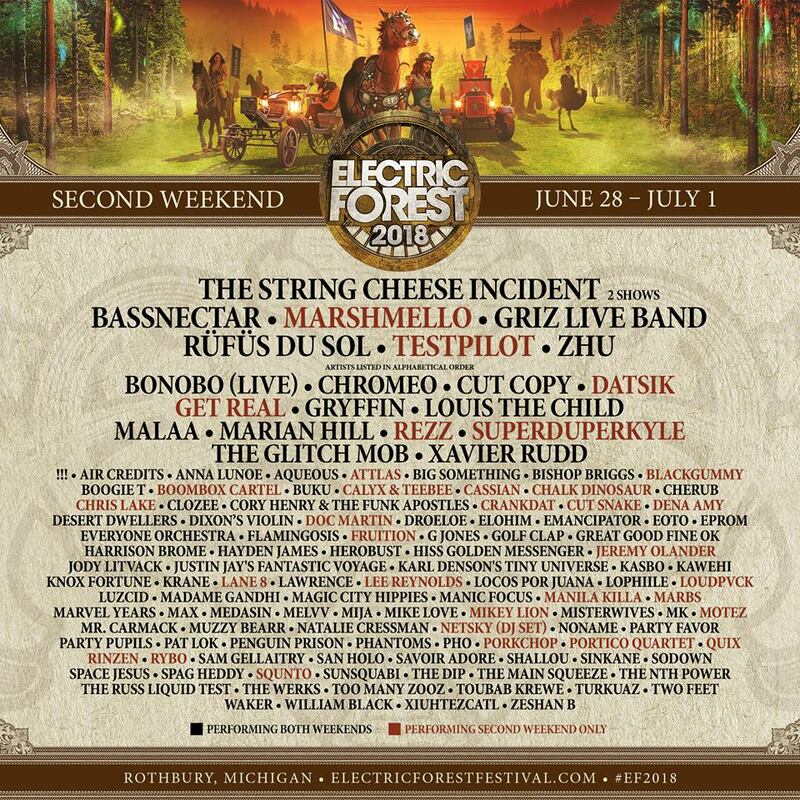 Electric Forest is one of the biggest festivals in the nation and with this lineup, how could you not want to go? Especially with the epic lineups that will be going both weekends. With a handful of artists going both weekends like, Zhu, Bassnectar, the String Cheese Incident, Malaa, Bonobo, and more, along with artists catering to only one, weekend, 2018 looks like it will be an insane year! Join the Forest Fam and buy tickets while they are still available! Discover the music going both weekends with our playlists! Want another massive festival with 80,000+ (most of them campers?) 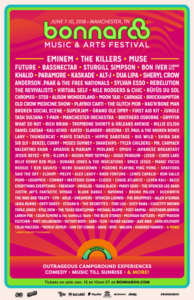 Bonnaroo in Tennessee looks like they will be having their biggest year yet! This lineup is massive! From Eminem to Muse to Paramore, to all the epic edm acts we love such as Bassnectar, CloZee, Space Jesus, Virtual Self (who is Porter Robinson’s newest alias,) Shiba San, and so many more! Not only do they bring world-renowned artists with tons of support adding up to over 150 acts, but they bring comedians to keep things fresh and your stomach aching from laughing. With 700 acres to play on, Bonnaro is an experienced festival with tons of quality history and legendary performances. 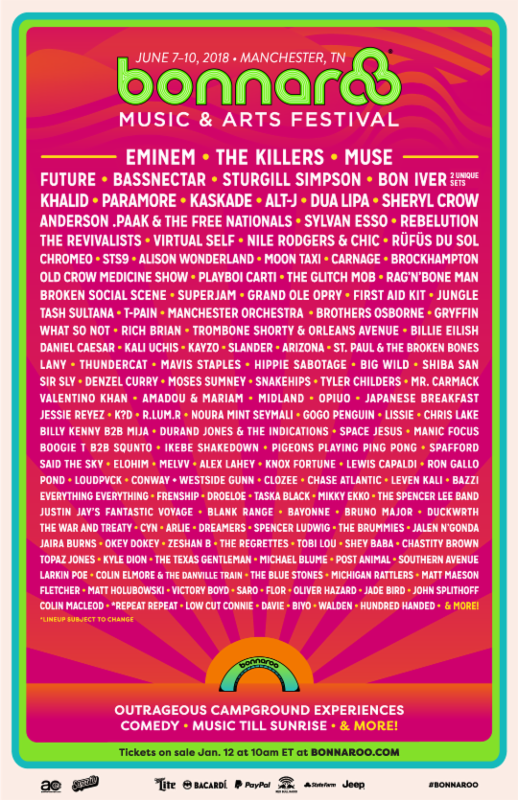 They always have their unique Bonnaroo Super Jam who this year could be extremely interesting. Buy tickets meow! Now Suwannee Hulaween is extremely far out! As a Halloween themed event, it is the last weekend of October. But this place is something else. 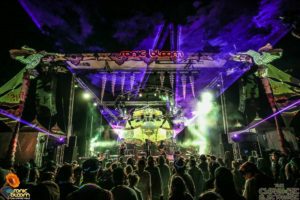 Hosted in the Spirit of Suwannee Music Park, Live Oak, Florida, curated by the minds of The String Cheese Incident, Hulaween has grown into one of the leading festivals in America, as many have called it a mini Electric Forest and it is… capping out at 20,000 people, Hulaween holds a packed venue while still having the capability for intimate sets. 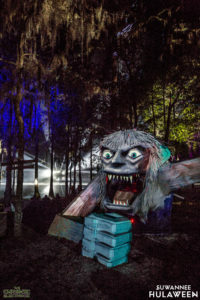 The creativity in this festival is next level, as art installations, live painters, and all the design and stage decor are directed to a theme of psychedelic horror. Now is it really scary? No? But it’s mind-blowing and exhilarating. Not only do the staff and artists keep the theme, but all the campgrounds (if you are cool) set up Halloween decorations to not only keep their campsite noticeable at night, but to keep the ghouls out of your tents, (or are they already in them?) Now what is even better? The location and the vibe of the nature there. In the Spirit of Suwannee, the spirit finds you. Hidden by Spanish moss, oak leaves, and peaceful swamp vibes, the Spirit of Suwannee is a real thing, and you’ll only get to experience when you are there in person. Which is why they sit at #3 on our list of camping festivals that you have to attend! For the first time ever, camping & RV’s at EDC Vegas. Lets just take a moment to take that in…Ok. Have enough time? 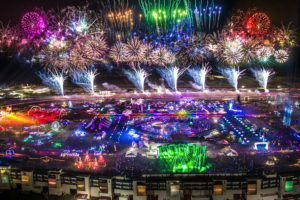 Because EDC is EXTREMELY fast paced with 9 main stages to choose from between the times of Dusk and Dawn and 400,000 people over the weekend, EDC gets gnarly! Over the course of 4 days, with Thursday being exclusive to the campers only, the amount of music to be seen is mindblowing! With over 200 artists to choose from with some of the CRAZIEST production in the scene from Insomniac Events, EDC Vegas in the ultimate stimulation for your eyes and ears! Hosted on the Las Vegas Speedway from May 18-20th (May 17th for campers,) Campers will have the privileges to Go-Kart Racing, Pool Parties, re-entry to campsites and music areas, and so much more! Cross EDC Vegas off of your bucket list this year and make memories Under the Electric Sky. There is nothing like the Unified Field. Here at Sonic Bloom, at the Hummingbird Ranch in Southern Colorado, you will have one of the most utterly beautiful and enlightening experiences as the vibes here are truly one of a kind. Founded by Jamie Janover, Michael Travis (of Eoto & SCI), and Aaron Holstein, Sonic Bloom thrives for the ultimate creativity as it has a carefully thought-out lineup that showcases a beautiful blend of electronic music and jam. 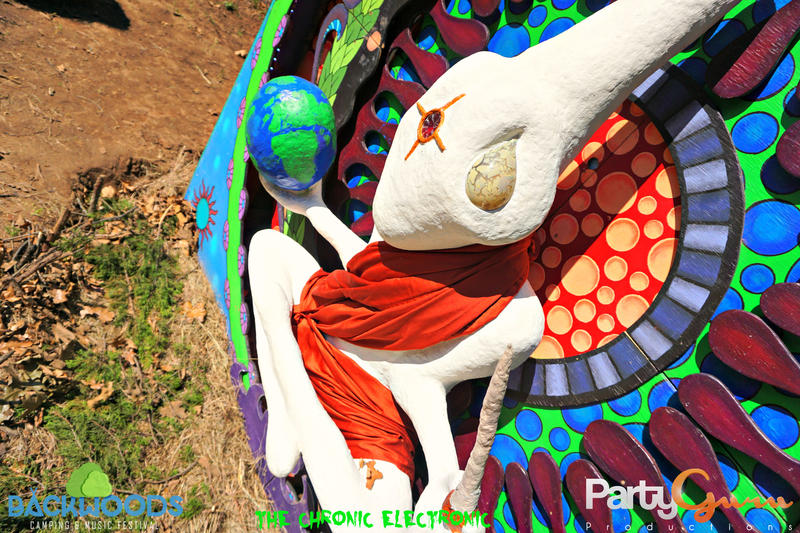 Sonic Bloom is labeled as Colorado’s Premier Electronic Festival, and with the acts that they consistently bring to the Hummingbird Ranch, it clearly shows that. From bringing some of the hottest and biggest names in the scene to the locals who are the back bone to the Rocky Mountain music scene, to some of the craziest and most beautiful art that you will ever lay your eyes upon. Which includes highly skilled stage performance art, glass blowing, screen mapping, laser work, live paint, wood-working, and so much more! Not to mention there is a Sonic Bloom Academy during the weekdays before the event that offer 4 different classes; Ableton Live Master, Visionary Art, PermaCulture, and Movement Art Series. This relatively small festival is perfect for the weekend getaway for ultimate relaxation as this ranch is nested upon the base of a mountain side with scrub oak forests throughout the venue and a creek for chilling during the day time. 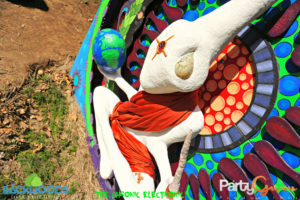 Usually planned during the Summer Solstice, Sonic Bloom is in the heart of the summer festival season as this year is scheduled for June 14-18th. The lineup will be released REALLY soon but no matter what the lineup is, this is a festival you can always count on to be just absolutely smooth sailing and a crazy yet relaxing music festival experience. Grab your tickets early and join the Unified Field this year! Want to know more about the Unified Field, check out our in-depth review here! This entry was posted in Event Media, Music Festivals, News, Previews & more. Bookmark the permalink. Great post. I haven’t heard of over half of these and interested in checking some out next year. Camping at festivals is so much fun! !